�����Nearly everybody collects some sort of Gold whether it is jewelry, bullion, or U.S. Gold coins. But not everyone has the knowledge and wherewithal to compete for and collect Early U.S Gold coins. �����Intriguing to the collector and enticing to the investor, Early $5 Gold coins, specifically the Capped Bust from 1807 to 1812, have been in strong demand for the last five years. This series has a low original mintage and many are being stashed away by advanced collectors, so these coins can be hard to find. There are a total of just 46 MS65 coins certified by NGC and PCGS for all dates with only 11 grading higher. It is virtually impossible to collect a complete set in MS65 or higher. The most common dates in MS65 are the 1809/8 and the 1812. The following graph shows the Fair Market Value of the 1812 in MS65 from July 2005 to today. �����Since July 2005, the 1812 has advanced from an FMV of $61,750 to the current FMV of $113,750; that is up nearly 85% in seven and a half years. Its most recent high was $136,500, which was recorded from March 2008 to January 2010, back when Early Gold was scorching hot. 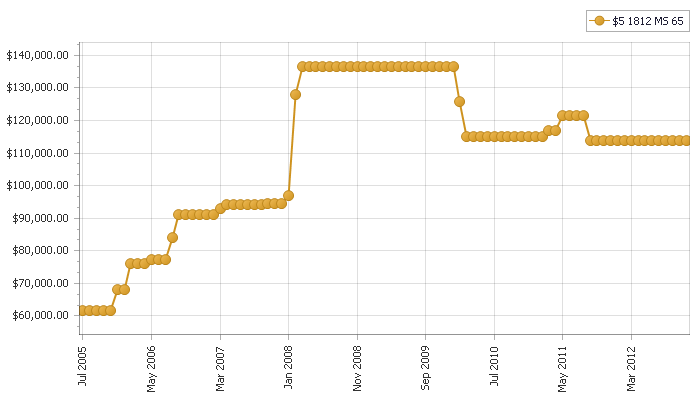 Since then we have had a more stable market with most Early Gold trading at current levels. This coin is very difficult to acquire in MS65 and the number of collectors for these Early Gold coins seems to be increasing as well. �����Not only are the high grade coins in demand, so is the entire series. The original mintage of all dates in this series is a mere 399,013 coins, and many of these were either destroyed or are in such aggravated condition that they do not qualify to be certified by either NGC or PCGS. The total of all coins certified by NGC and PCGS combined is only 2,870 coins; this includes all certified circulated coins in Good through AU58 and the Mint State coins. The following chart lists the number of coins certified by date; this is broken down into two categories, circulated and Mint State. We also listed the highest grade certified for each date, along with the original mintages. Some of the original mintages, marked with an asterisk (*), were part of the original mintage of the same date (listed directly above). �����There are only 1,478 coins available in the Mint State grades, and this number is likely inflated slightly by resubmissions. The least expensive MS60 coin is the 1811 at $12,500. The majority of the coins that come onto the market are usually in the low AU grades, and even then you are still in the $9,000 range. This is definitely a series for the serious collector/investor.